MERP was produced by ICE, producers of Rolemaster. Having landed the Middle-Earth licence, they had put out a world guide to the setting in 1982, but they went system neutral with it, providing guidelines for adapting a range of different popular fantasy systems of the time to the needs of a Middle-Earth campaign. This strikes me as a smart move -after all, when you’ve landed what is arguably the biggest IP licence in fantasy literature, why limit yourself to just selling it to customers of your house system? – and it was in keeping with the commercial trends of the time, Chaosium having given Thieves World the multi-system treatment the previous year. However, as the 1980s went on such cross-industry collaboration and permissiveness would go out of style, particularly once TSR and Palladium Books started to flex their legal muscles as a matter of course. On top of that, ICE must have realised that the Middle Earth licence had the potential to reach an audience beyond the existing roleplaying fandom, so an entry-level rules set aimed squarely at them could be a big hit – and if they played their cards right, it could drive sales of both their MERP setting material and their existing RPG rules. 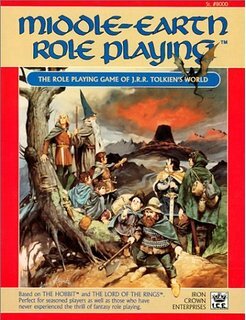 Debuting in 1984, MERP is famously based on a scaled-back version of Rolemaster, and it seems to have been designed with the assumption that people would graduate to using Rolemaster in place of the MERP system when they were good and ready; the text directly encourages this and goes out of its way to mention that you are only getting a fraction of the magic and rules for characters of 1st-10th level and so on and so forth if you stick with just the MERP rules. The big problem with this drive to encourage people to take up the advanced game is that even the lower-powered characters of MERP don’t really seem to fit the Middle Earth setting. The glaring problem is magic. In Middle Earth magic is rare and always getting rarer, with explicit magic use basically being limited to the Valar and Maiar and mmmmmmaybe elves and dwarves if you count their exceptional craftsmanship as quasi-magical. Conversely, because all of its character classes are inherited from Rolemaster, everyone in MERP can learn magic, and magic a good deal flashier and easier than what Gandalf pulls out of his hat in the books. Relatedly, whilst Rolemaster-style critical hits might be awesome, I don’t remember Tolkien making a habit of using precisely described maimings and injuries to spice up combat scenes, though I guess I could see Peter Jackson drawing on the critical hit tables here. See, the thing about games based on licences is that they really need to capture the atmosphere of the work they are based on, particularly when that work has a tone as unique as that of The Lord of the Rings or The Hobbit. MERP does have a particular atmosphere of its own, but that atmosphere doesn’t say Lord of the Rings to me – it says Diet Rolemaster. And the thing is, even if I wanted to go through the exercise of running Rolemaster in a setting it doesn’t really fit to see how the rules end up warping the setting, I’d be inclined to just use full fat Rolemaster, particularly since the version here isn’t really significantly more simple than core Rolemaster, it just tends to provide you with less options, which isn’t the same thing. (And in some cases it actually offers you more options than you really want -there’s a baffling range of different types of human, and also it offers the opportunity to play several types of orc and troll, which I suspect 99% of people wanting to play a Middle Earth-based game will have no interest in doing.) If you can handle the combat in this, you can handle the wider range of critical hit charts in Arms Law; if you can handle the mechanics of learning and using spells in this, you can handle Spell Law; if you can handle character creation in this, you should be able to work out Character and Campaign Law for yourself. In short, MERP could only be mistaken for being rules-light by folk who’ve been immersed in rules-heavy RPGs for so long that they’ve forgotten what a genuinely simple RPG system looks like; whilst this could pass muster in the 1980s, when the general fashion was towards increasing complexity, by the 1990s genuinely rules-light RPGs emerged and ICE ended up putting out a Lord of the Rings Adventure Game, which was a simplified version of MERP because they realised MERP wasn’t a simplified enough version of Rolemaster. It feels like I’m being harsh here, and I don’t really want to be. MERP is a fun game, but that’s because it’s basically Rolemaster, which I’ve previously said is a fun game in its own right. From what I’ve heard it succeeded at introducing a receptive audience of Tolkien fans to RPGs, and it would be churlish to hold the fact that one of those newly-minted gamers grew up to become Varg Vikernes against it. It just doesn’t feel like a Middle Earth game, and that kills stone dead more or less the only reason to opt for MERP instead of just running core-rules-only Rolemaster. Here is the real magic. Originally released in a handsome slipcase version with a player’s book, a book for the referee (called the Loremaster here), two nice big maps and a set of special dice, it’s also been rereleased recently in an updated and revised single-book version (presumably in part because of the high cost of reprinting the slipcase edition). I happen to own the slipcase version, and it’s absolutely gorgeously illustrated and presented; the company that actually has the tabletop games licence for the books (and who subcontracted the work out to Cubicle 7) is called Sophisticated Games, and this certainly fits the bill as far as that criterion is concerned. It is absolutely trivial to substitute in ordinary dice for these, but the special dice are quite cleverly designed – between the runes and the colouring, they are well-optimised to allow you to quickly eyeball a roll and see if you’ve got beyond the target number quickly. Moreover, the use of the runes helps capture the atmosphere of the books – and The One Ring really does go all-out to do precisely that. Characters don’t so much level up as gain Wisdom and/or Valour; each increase in one of those simultaneously lets you pick some form of more concrete character advancement and also gains you additional respect from those who value the quality you decided to boost. Likewise, you have a “Hope” score to denote where your mental reserves are at and a “Shadow” trait to show how much your resolve has been shaken or undermined by the influence of the Dark Lord (whether this be due to ill acts on your part, or witnessing the works of evil, or simply being tainted by the Shadow’s influence in the world); if you end up in a situation where your Hope dips below your Shadow score, you end up with the wonderfully-named “Miserable” condition – which can also be the forerunner of a bout of madness if you end up rolling the Eye of Sauron whilst Miserable. Each bout of madness sends you further along the appropriate track (based on your Calling – your character class, in other words), so some characters will find themselves becoming greedier and greedier from the dragon-sickness, others will find their temper becoming shorter and shorter, and so on. Hope can also be used to give bonuses to rolls – spend a point of Hope on a roll, and you get to add the appropriate Attribute to it (thankfully, unlike in Numenera where spending points like this will almost always be wasted, you are allowed to wait to see what the roll result is before spending Hope) – and the party as a whole has a pool of Fellowship points you can dip into to replenish your Hope in a pinch. You can seek the approval of the majority of the party to take points from the Fellowship pool – or you can be all like We wants it, it’s our birthday! and grab the points anyway, getting yourself a dose of Shadow as a result of being a grabby piglet. Similarly, when characters are exerting themselves a lot (for instance, in combat or on long journeys) and their Fatigue level exceeds their Endurance score, they become Weary, which has various effects – for instance, whilst travelling if party members become Weary it’s likely that the party will run into dangerous hazards. The journey mechanics in this are extremely well-explained and actually make this one of the few games which make me want to bother counting hexes on maps and tracking encumbrance levels (thankfully, the encumbrance system is quite simple), because of course the more of a burden you are carrying the faster you get Weary when travelling. (Frodo was unlucky enough to have a Loremaster who dicked him over on just how much encumbrance a single gold ring represented…) Between the rules for getting Weary and the hazards you can face, the game makes travelling through Middle Earth feel like a slow, desperate slog in particularly Shadow-blighted realms whilst allowing you to cut a fast pace in more gentle realms, and in general captures the feeling of the travelogue sections of the books remarkably well. Another way in which the game captures the spirit of the books is in the structure of gameplay. In particular, you are encouraged to have significant talky encounters take place in an interestingly formalised manner that is reminiscent of the almost ritualistic way characters present themselves to strangers in the books; first the party decides whether to have a single spokesperson speak for them or whether they’ll all be talking, then a Tolerance level is set for the encounter in question, based on the Wisdom or Valour of the party in question and the Standing of its members amongst the people addressed. Run out of Tolerance with someone you’re negotiating with, and they’ll lose patience with the encounter and send you away at best. This encourages players to take care when negotiating, and in particular to avoid dragging conversations on interminably, and also is appropriate to the subtle emphasis Tolkien puts on manners and etiquette in the books. Another aspect of how gameplay is structured is the division of the game into Adventuring and Fellowship phases. Borrowing an idea from Pendragon, the game assumes that most PCs at most go on one adventure per year and allows for a rest period (the Fellowship phase) in between adventures during which PCs can take various downtime actions. 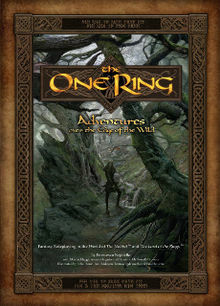 This generational style of play is in keeping with the selection of time period for the game; the assumed start of campaign date is five years after the Battle of Five Armies at the end of The Hobbit, and Cubicle 7 intend to produce material to support play all the way to the end of the War of the Ring. This is more focused than MERP, which tried to support play from any time from the Second to Fourth Age, and also positions the player characters to usefully engage with major events of the saga. The setting covered in the core set consists of Mirkwood and the lands around Dale, Laketown, Beorn’s House and the Lonely Mountain; this is an area which is simultaneously familiar from The Hobbit but where we don’t know much about what went down in the locality during the War of the Ring, so whilst the PCs might not get to dump the One Ring into Mount Doom (unless the Loremaster decides to deviate from canon), their actions could still make the difference between this region standing strong against the depredations of Mordor or being reduced to wasteland. Gorgeously packaged and illustrated, The One Ring is the BBC radio drama to MERP‘s Peter Jackson movie – it’s the only RPG adaptation I’ve seen that seems to have a remote hope of feeling like you are stepping into the books, and I can’t wait to give it a proper try.